The Gamut of Cameras. Oh, you thought I meant Color Space ;~). Article on dslrbodies.com. Even Amazon Doesn’t Get It. Amazon this week announced two Amazon Cloud Drive plans, one of which ought to be of great interest to photographers. Article on dslrbodies.com. Starting from Scratch. It’s rarer than the “what should I upgrade to” questions I get, but I still receive quite a few “if I’m starting from scratch, what should I buy” questions. Article on dslrbodies.com. Camera Makers Don’t Really Pay Attention. What if I told you that car makers never drove their autos, let alone take them to test tracks to see what they could really do? What if I told you that car makers never really paid any attention to what customers said about their autos after driving them for awhile? What if I told you that car makers never noticed that people were taking off the supplied wheels and putting on different ones, almost universally? Article on dslrbodies.com. Back of the Envelope Numbers. I kept finding that my responses to your responses to yesterday’s article about a possible D300s replacement tend towards “Nikon would be leaving a lot of dollars on the table by not making a D300s replacement.” Okay, how many dollars is “a lot?” Article on dslrbodies.com. The Missing D300s Replacement, Redux. Comments I made concerning the D7200 introduction—that I felt that the D7200 specifications left open room for a D300s replacement—continue to get a fair amount of comment and questioning. Rather than answer each of your emails individually, I’ll just try to collect my thoughts in one place (here) and point to that. Article on dslrbodies.com. Zeiss Touit Lenses on Sale. 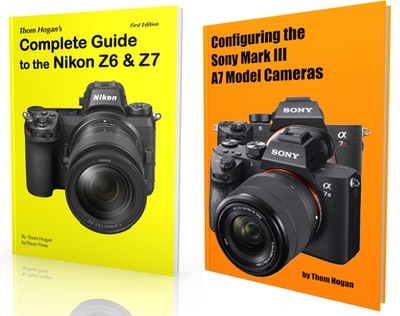 don’t usually comment on pricing adjustments, as they come and go too frequently to keep up with and the point of this (and my other) Web site(s) is not to steer you towards today’s greatest bargains, but rather to point out what’s truly new and useful in the digital camera world. Article on sansmirror.com. Samsung Announces NX500 Camera. Samsung took most of the internals—sensor, processor, etc.—from their flagship NX-1 camera and stuck it in their rangefinder style body and created the NX500. Article on sansmirror.com. Data page for NX500. Sony Officially Launches FE Lenses. Sony today officially launched the lenses shown in prototype form recently at CP+ and long ago talked about in their lens road map: 28mm f/2, 35mm f/1.4 Zeiss, 90mm f/2.8 macro, and the superzoom 24-240mm f/3.5-6.3. Article on sansmirror.com. 28mm f/2 data page, 35mm f/1.4 data page, 90mm f/2.8 data page, 24-240mm f/3.5-6.3 data page. Can You Live On Less? Today’s headline is dual-edged. First, it refers to the camera industry sales: can the industry get by with fewer sales? But it also refers to we users, too, as fewer sales are going to mean that the camera companies are going to have to make some tough choices in which future products to offer. Article on dslrbodies.com. March Software Updates Article on dslrbodies.com. The Nikon Software Problem Okay, View NX-i is available to download. Hey, what happened to View NX2? Oh, it’s still available. Article on dslrbodies.com. Nikon Introduces D7200 DSLR. Are you happy or disappointed? Nikon on March 2nd announced the D7200, a minor update to the D7100 camera. The major changes are… Article on dslrbodies.com. Nikon Buys Optos. Nikon announced plans to diversify into the medical business at the end of their fiscal year results meeting in May 2014. In February 2015, Nikon opted to purchase all shares of Optos, a retinal imaging company based in the UK, but which has most of their sales in the US. Article on dslrbodies.com.